DemoCurmudgeon: Walker trolls with dumbest tweets that can't help but embarrass state. Walker trolls with dumbest tweets that can't help but embarrass state. 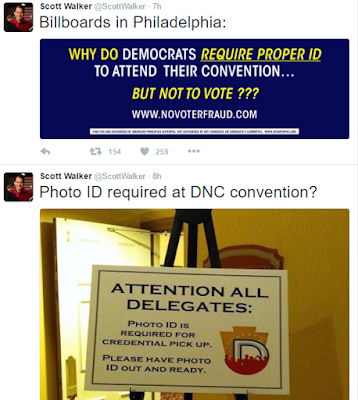 I would have assumed Scott Walker did all he could to appeal to the lowest common denominator with these recent tweets. But in an uh-oh moment, he appears to think just like them, unapologetically. He really doesn't get the difference? Maybe now you know what we're dealing with in Wisconsin. Why did gun nut republicans deny honest,God fearing Americans their lawful 2nd amendment right to bear arms at their convention?